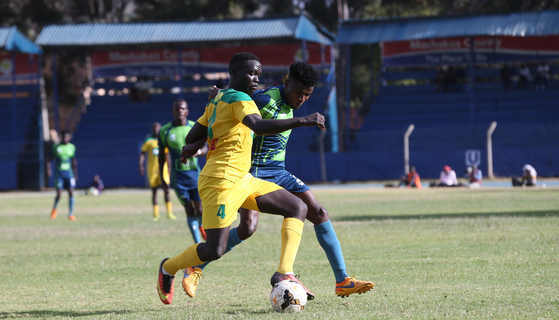 Clinton Kisiavuki scored in the first half as KCB dimmed Mathare United’s hopes of fighting for the title with a 1-0 defeat in Machakos on Wednesday. Mathare who would have gone second with victory now remain fourth and their title hopes all but diminished. Mathare had a way back into the game with a second half penalty, but Kevin Kimani saw his effort saved by Zamu Adisa. Kisiavuki prodded home the goal after 23 minutes, after keeper David Okello failed to have a firm hold of Kennedy Owino’s cross from the right. Cliff Nyakeya had the game’s opening chance after 11 minutes when he cut into the box from the right but he chose to go for a shot from a tight angle instead of cutting back to his teammates, the effort whistling across the face of goal. In the 13th minute, Eston Esiye had a chance with a shot from the edge of the box but it flew inches over the bar following a sweeping team move by the bankers. Five minutes to the break, Mathare had a chance to get back level when Nyakeya’s cross from the left found Clifford Alwanga lurking at the edge of the six yard box but the striker could not punish his old employers, angling his header wide. Mathare had the chance to get back level in the 64th minute when Bethwel Warambo was adjudged to have handled the ball as he tried to deal with a James Kinyanjui cross, referee Peter Mwai pointing to the spot. Kimani stepped up but a fully stretched Zamu Adisa parried his effort away. From the counter following Adisa’s save, KCB thought they should have had a penalty when Harun Junior seemed to have handled the ball from Kennedy Owino’s cross. The bankers had another beautiful chance in the 78th minute when Crispinus Onyango dribbled his way into the box but a combination of a good block from Andrew Juma and the outstretched arms of keeper David Okello denied him the chance. In the early kick off, Tusker FC was held to a 1-1 draw by Western Stima with keeper Samuel Odhimbo scoring Stima’s equalizer from the penalty spot midway through the second half after Laban Gambareko was hauled to the floor by Brian Odhiambo. Boniface Muchiri had given Tusker the lead in the first half, breaking the offside trap before shooting low in between Odhiambo’s feet.